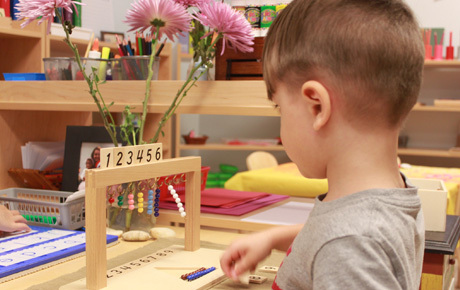 The educational Montessori approach focuses on the importance of establishing a child's independence, and on the development of a child's psychological, physical, and social needs. 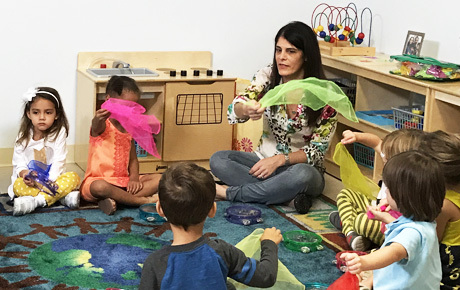 Dr. Maria Montessori created this curriculum to ensure each child receives individual attention in school to help mold his/her distinct personality. The students are given goal-oriented tasks, which they attempt and succeed at their own pace. We value a child's personal interest. Therefore, we provide them freedom to move about in the classroom and choose a subject or material that sparks a thirst for learning. 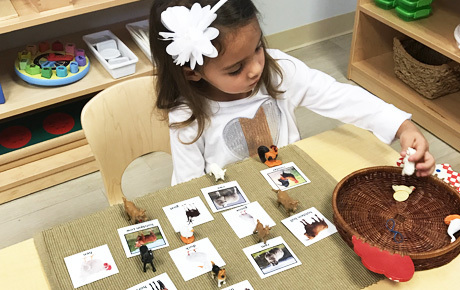 The Montessori method splits the genres of education into five different areas. 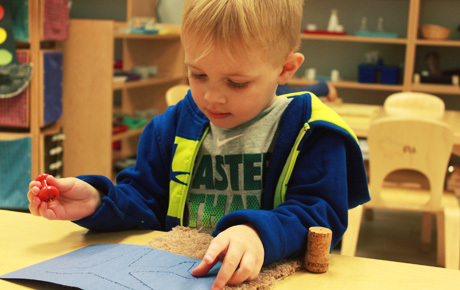 Our curriculum incorporates concrete materials in every area of learning to give life to abstract concepts. 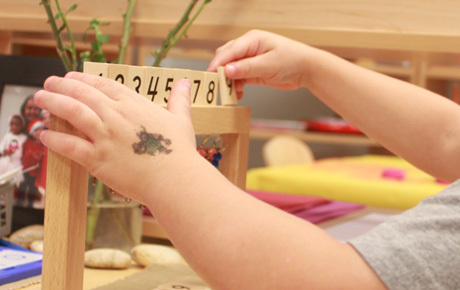 When children learn by a hands-on approach they can expand their imaginations even further. In our hands, your children will build their confidence, their sense of respect, and will learn to care for the world we live in. 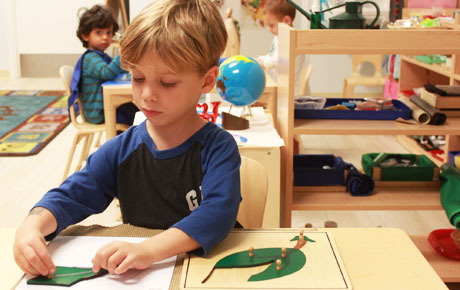 Montessori education is a unique educational system, established by Maria Montessori. She was a well-versed woman who was an instructor, pioneer, and doctor. 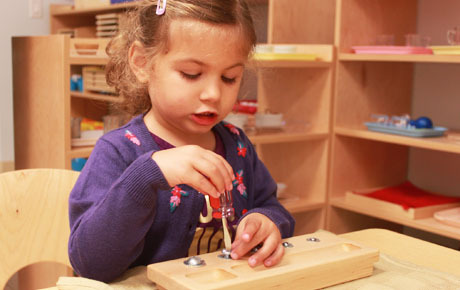 Dr. Maria Montessori observed the developmental needs of children from a young age through their teenage years. From her results, she unraveled methods which release a child's natural course of becoming more learned. 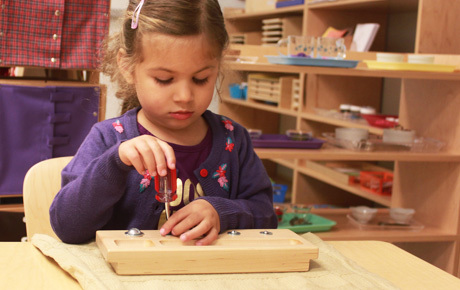 The first Montessori school opened in Rome on January 6, 1907. It was called “Casa dei Bambini”, which means “Children’s House”. After growing her Montessori roots in Rome, Dr. Maria Montessori then went on to plant her seeds around the world. She made a marvelous impact on how we teach our children today. Years later, we are honored to be a product of her seed, and to have blossomed from her principles into a school that guides children in discovering how to be the best version of themselves. 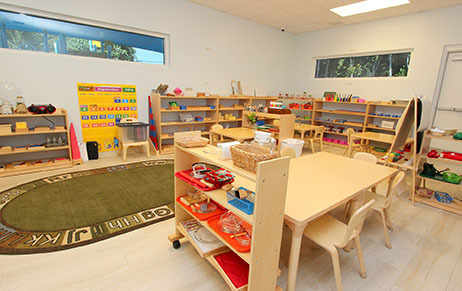 The Nido classroom is designed to feel safe and comfortable, like a home. 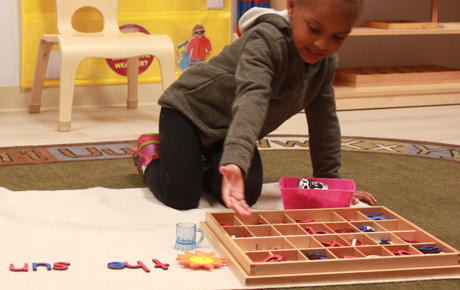 Our babies and toddlers have mesmerizing materials to play with, and serene music to listen to. 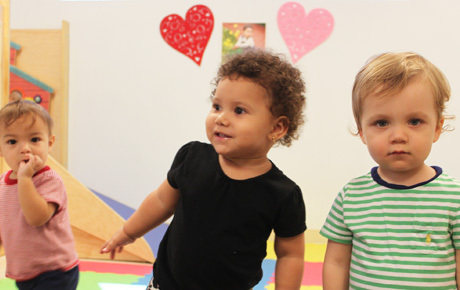 Babies who are still learning to walk practice standing up using shelves that are placed at their eye level. Eventually, infants begin learning how to eat at a table with all their classmates. 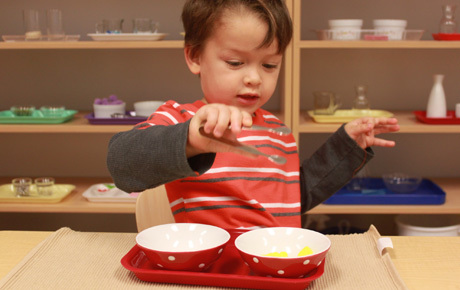 The toddlers enjoy learning how to properly use utensils, and thus improve their ability to feed and pour drinks for themselves, all while using custom infant size objects. The Nido teachers provide unlimited care and devotion to help all the children individually reach their full potential as babies. Babies who are still learning how to walk practice standing up using shelves that are placed at their eye level. 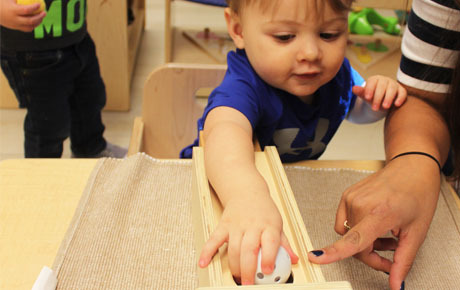 By improving their hand eye coordination, children have a smoother transition into the Toddler - Infant Community and then into the Children's House. 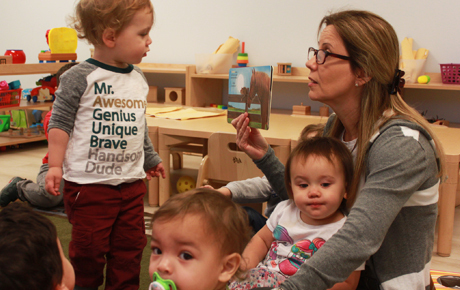 Providing toddlers an environment to explore their innate desire for discovering the world around them is the focus of the toddler community. 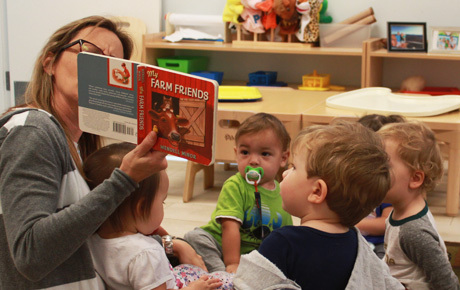 We provide an arena of supervised freedom, allowing toddlers to naturally and independently demonstrate their readiness to take on something new and proceed with an activity or learning material. 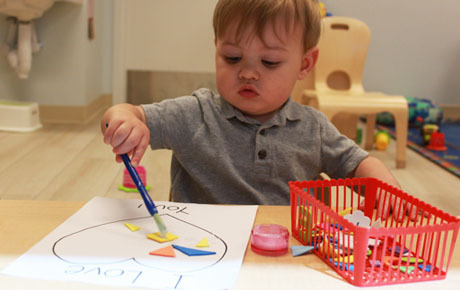 Within the engaging toddler curriculum, children develop their fundamentals of speech and language, and begin to dip their toes into a pool of practical life skills. 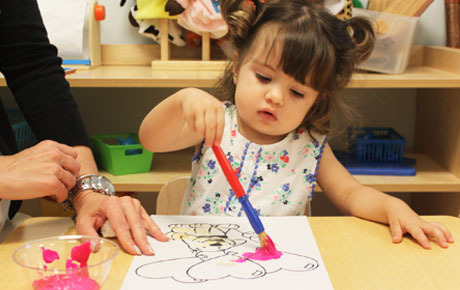 Once kids are three years old and ready to progress to the next classroom, they enter the Children's House. 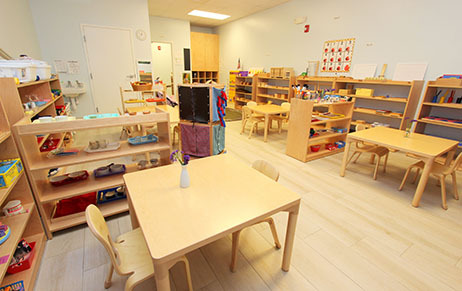 This environment is carefully prepared to gradually develop a child's independence, and common knowledge. The first phase introduced to students is comprised of practical life activities. Students actively and eagerly learn daily tasks, by performing them with items made to fit their youthful hands. 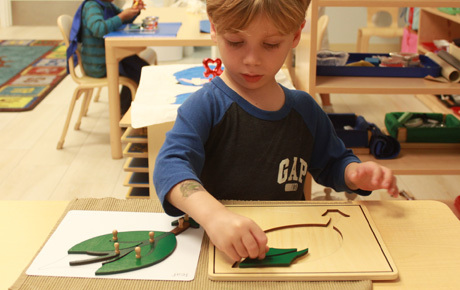 Children continue to explore and mature their senses through the multi-faceted stages of the Montessori curriculum. 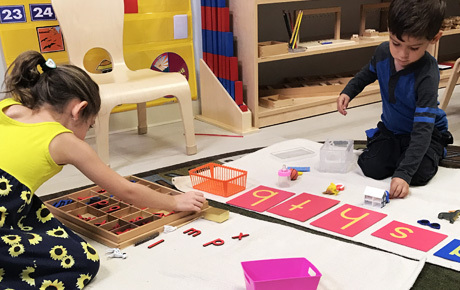 All areas of the Montessori approach shape children's characteristics with the incorporation of their hands and imaginations. Throughout the course, students continue to build on their independence, respect, and care for the world around them. By learning to care for oneself and the environment, children begin discovering their independent side and their potential to impact the world around them. "Hello, how are you?" 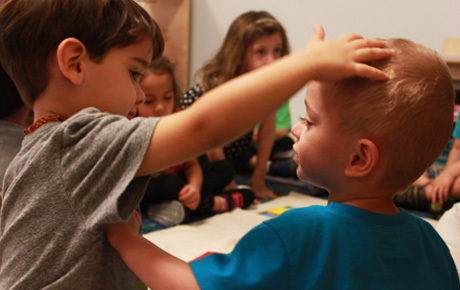 A daily greeting is just a small dose of what children take with them from the practical area. Being taught a simple, common, phrase helps build the foundation of a polite and professional adult in the future. 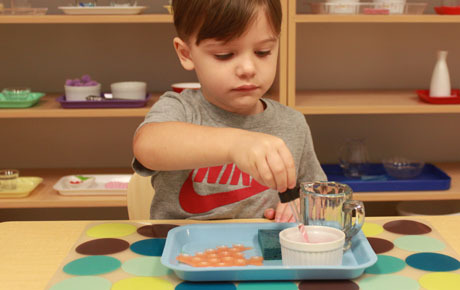 The practical life engages kids in "home-like" activities in a fun, child-size setting. 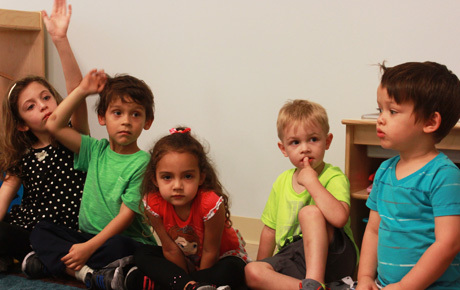 Students eagerly learn to manipulate daily objects with their own curious hands, such as tying their own shoes. Progressively, children will innately crave partaking in practical life activities that trigger a personal interest. 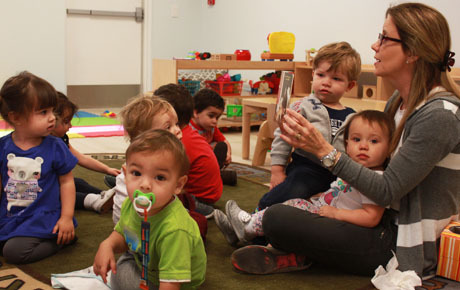 This allows their growing minds to repeat practical, developmental movements, and mannerisms by doing something that creates smiles on their faces. The values of self-care, and love for environment, are etched into the children's hearts and minds. 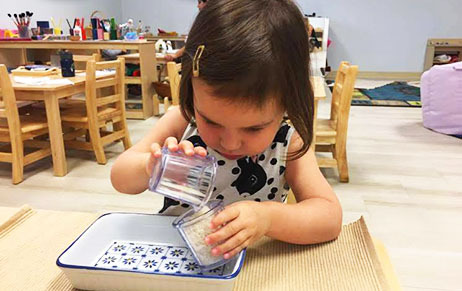 Learning how to use your five senses is instinctual, but in a Montessori curriculum we take it to the next level. 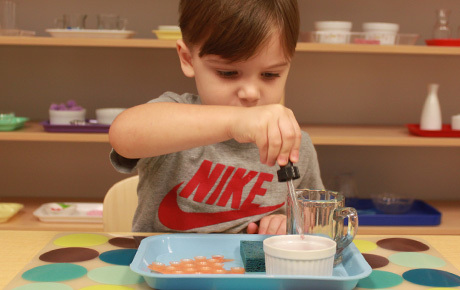 By exploring the sensorial area, children activate their five senses, beyond day by day practices. 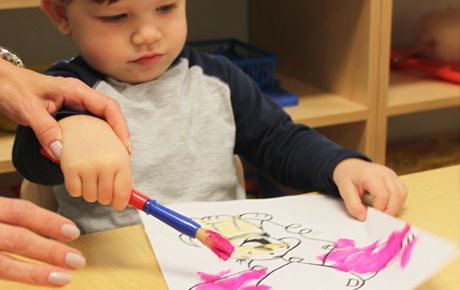 We encourage and kindle the child's mind to sharpen his/her senses by a hands-on approach, in a comfortable environment, tailored for children. 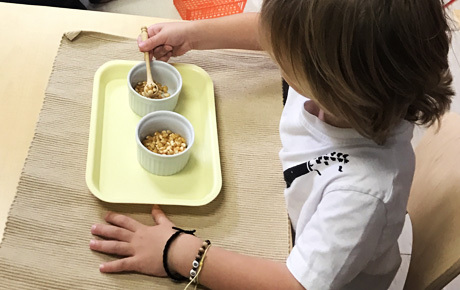 By a variation of colors, weights, shapes, sizes, textures, sounds, and smells students activate their five senses and begin to build the basis of their intellectual capabilities, to last them a lifetime. 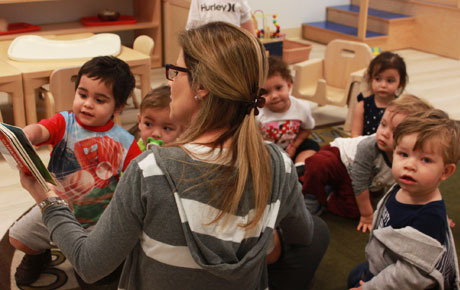 Through compelling, stories children begin to touch upon the concepts and beauty of language development. 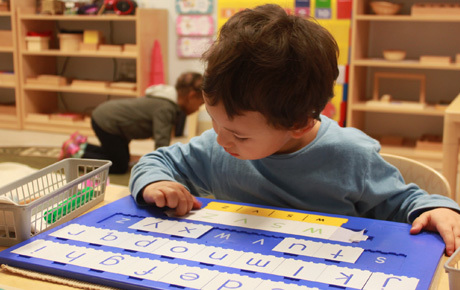 From the ages of 3-6, language development is crucial for their creative, and unlimited, young mentalities. They are excited by each new sound that they are introduced to by participating in fascinating phonetic games. 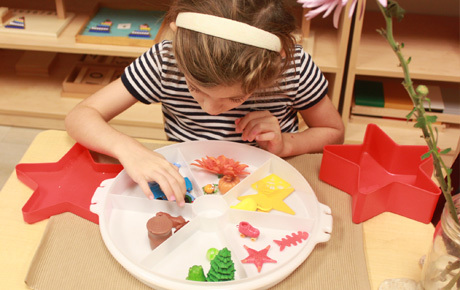 Children look forward to engaging in activities and using their imaginations with concrete learning objects. 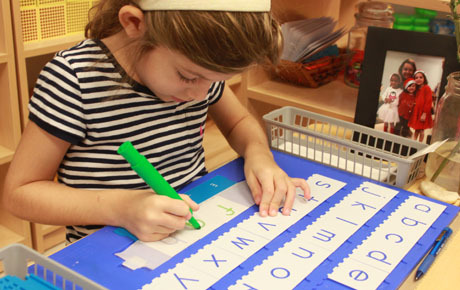 Following the hands on approach, children are introduced to preparatory sounds with sandpaper letters, by feeling them and hearing the sounds that are produced. By age 6, children explore a new, and exciting side of language: grammar concepts. Our students are proud to learn the next steps of how to properly form a sentence. 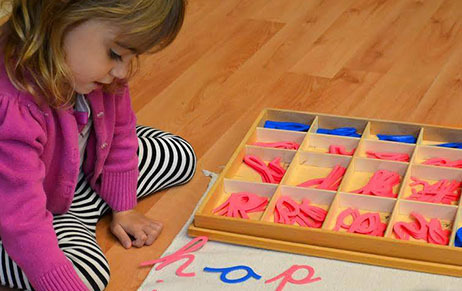 Language contributes to forming a child's comprehensive mindset, through inspirational and exhilarating exercises. 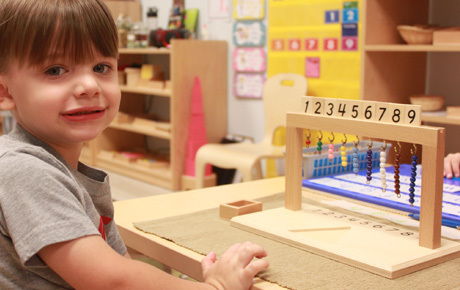 At Montessori, math is taught using concrete materials, which children are enlightened and ambitious to work with. 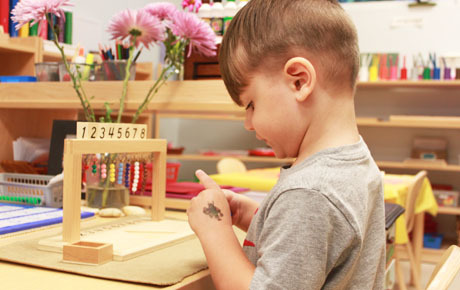 Dr. Maria Montessori had a realization that all children have a "Mathematical Mind". Therefore, we lead our students into extracting their mathematical spark through exploratory arithmetical opportunities. Working with the pink towers is a highlight of this area. 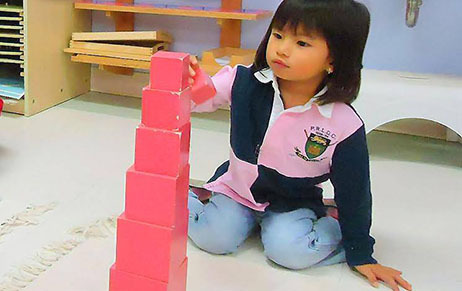 The children adore building the towers, using the pink cubes. 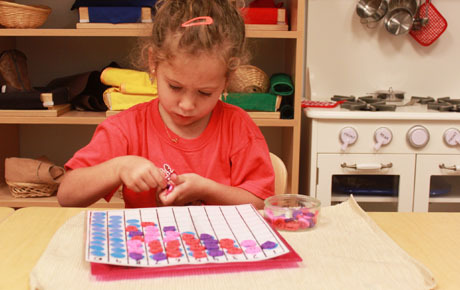 The pink tower activity is a fun and interactive introduction to the Decimal System of mathematics. 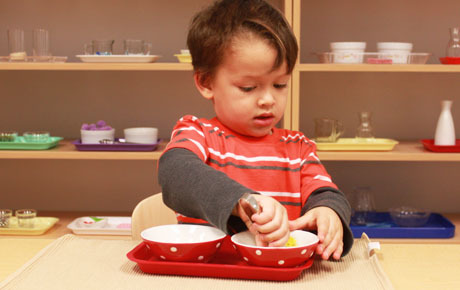 By implementing physical materials, children participate in exercises that enhance the collaboration of their minds and hands. They enthusiastically convert an abstract math concept into a fun, physical reality. 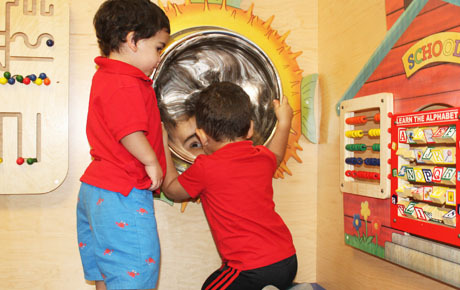 Children delve into a new realm of discoveries, which create everlasting impressions. Interactive experiences expose their eager to learn minds to a deep, enriched understanding and love for culture and diversity. 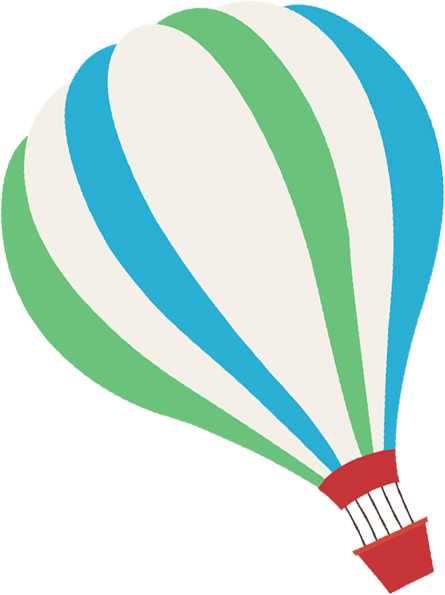 Children learn about a myriad of cultures, by imaginatively visiting landmarks on a globe and through compelling cultural stories. Games and worldly puzzles allow for their imaginations to explore distant lands. Thus, in the future, children develop a natural interest to learn about the individuality and personality of cultures from many countries as adults. As they discover our universe and all it's unique facets, they are simultaneously doing the same with themselves by unearthing, and maturing their own persona and characteristics. • Science - four seasons, the five senses, why leaves change color, layers of the earth, parts of a volcano, and biomes of the earth.